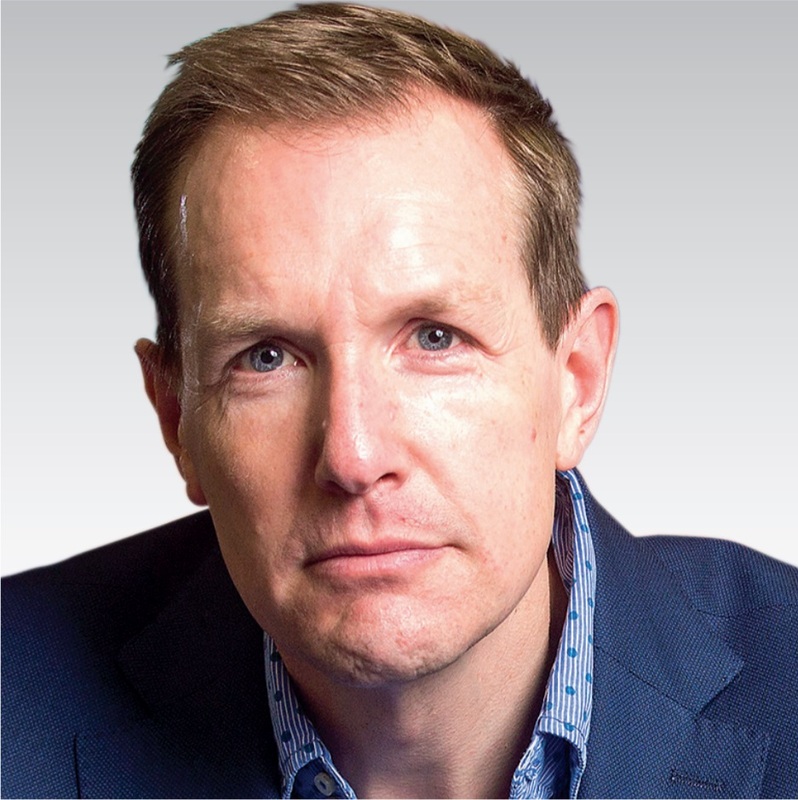 The past year has seen huge chief executive churn in our sector. So what’s going on? I spoke to several past and pre- sent chief executives in order to find out. The first thing to say, loud and clear, is that our chief executives do not appear to be quitting the sector as whole. Indeed, most of this year’s big departures have been widely applauded upward moves to other, larger charities. And, according to David Fielding, managing partner of the executive search firm Attenti, competition for chief executive positions remains high. But there is another, possibly untold story. It has been clear to the naked eye that a fair few chief executives are leaving earlier than usual after serving just two or three years. A good few of those I spoke to privately expressed frustration, although they were not willing to be named. All is not well in the garden. So what’s happening? 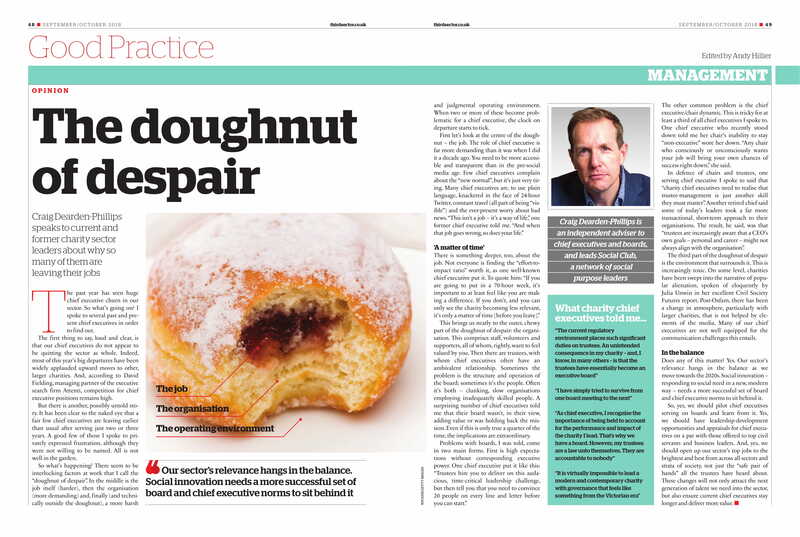 There seem to be interlocking factors at work that I call the “doughnut of despair”. 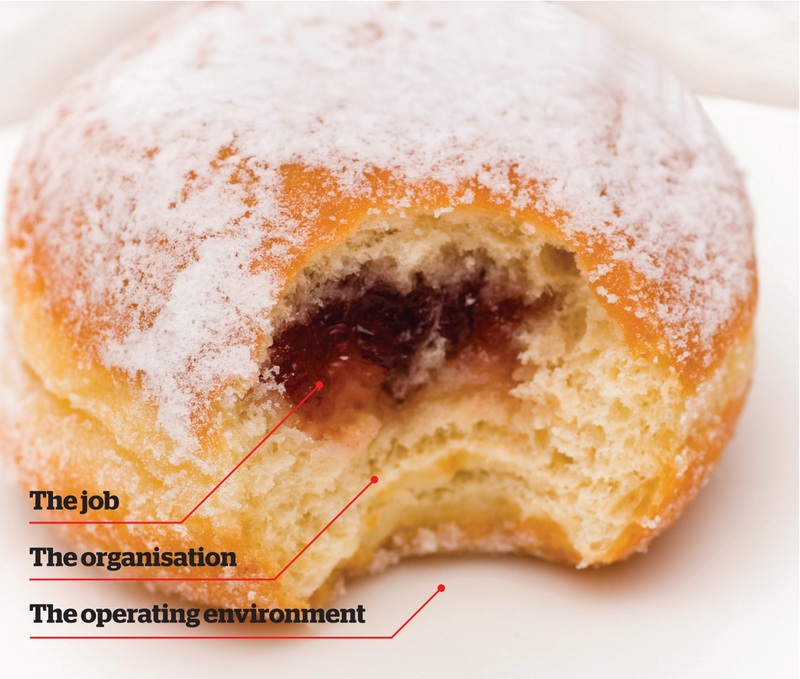 In the middle is the job itself (harder), then the organisation (more demanding) and, finally (and technically outside the doughnut), a more harsh and judgmental operating environment. When two or more of these become problematic for a chief executive, the clock on departure starts to tick. There is something deeper, too, about the job. Not everyone is finding the “effort-toimpact ratio” worth it, as one well-known chief executive put it. To quote him: “If you are going to put in a 70-hour week, it’s important to at least feel like you are making a difference. If you don’t, and you can only see the charity becoming less relevant, it’s only a matter of time [before you leave].” This brings us neatly to the outer, chewy part of the doughnut of despair: the organisation. This comprises staff, volunteers and supporters, all of whom, rightly, want to feel valued by you. Then there are trustees, with whom chief executives often have an ambivalent relationship. Sometimes the problem is the structure and operation of the board; sometimes it’s the people. Often it’s both – clunking, slow organisations employing inadequately skilled people. A surprising number of chief executives told me that their board wasn’t, in their view, adding value or was holding back the mission. Even if this is only true a quarter of the time, the implications are extraordinary. The other common problem is the chief executive/chair dynamic. This is tricky for at least a third of all chief executives I spoke to. One chief executive who recently stood down told me her chair’s inability to stay “non-executive” wore her down. “Any chair who consciously or unconsciously wants your job will bring your own chances of success right down,” she said. In defence of chairs and trustees, one serving chief executive I spoke to said that “charity chief executives need to realise that trustee-management is just another skill they must master”. Another retired chief said some of today’s leaders took a far more transactional, short-term approach to their organisations. The result, he said, was that “trustees are increasingly aware that a CEO’s own goals – personal and career – might not always align with the organisation”. The third part of the doughnut of despair is the environment that surrounds it. This is increasingly toxic. On some level, charities have been swept into the narrative of popular alienation, spoken of eloquently by Julia Unwin in her excellent Civil Society Futures report. Post-Oxfam, there has been a change in atmosphere, particularly with larger charities, that is not helped by elements of the media. Many of our chief executives are not well equipped for the communication challenges this entails. Does any of this matter? Yes. Our sector’s relevance hangs in the balance as we move towards the 2020s. Social innovation – responding to social need in a new, modern way – needs a more successful set of board and chief executive norms to sit behind it. So, yes, we should pilot chief executives serving on boards and learn from it. Yes, we should have leadership-development opportunities and appraisals for chief executives on a par with those offered to top civil servants and business leaders. And, yes, we should open up our sector’s top jobs to the brightest and best from across all sectors and strata of society, not just the “safe pair of hands” all the trustees have heard about. These changes will not only attract the next generation of talent we need into the sector, but also ensure current chief executives stay longer and deliver more value.